I wanted some pretty cobalt blue bottles for my perfume collection. My collection is displayed on the window sill of our master bathroom. 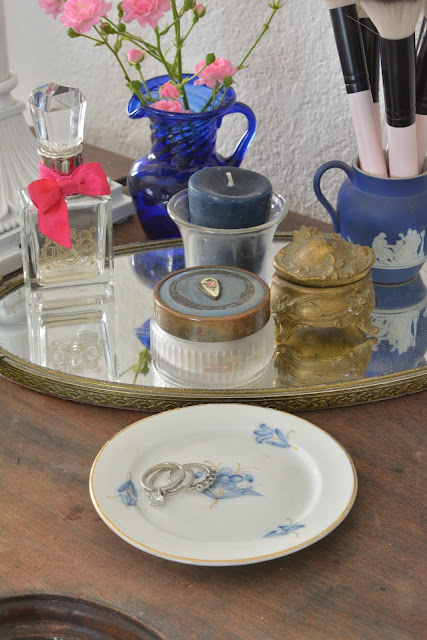 Blue bottles are a little hard to find but I found an Evening In Paris bottle at an antique mall. The woman that opened the display case for me, mentioned that she used to wear this perfume back during her youth. We began talking about our first perfumes. This conversation started me thinking about my fragrance history. Charlie by Revlon was all the rage when I was in H.S. It smelled horrible on me so Halston was my fragrance of choice. It is a blend of many things, Mint, Melon, green leaves, Peach, Bergamot, Carnation, Orris root, Jasmine, Marigold, Ylang Ylang, Cedar and Rose. There are also some woodsy undertones. It is the creation of Bernard Chant. In college White Shoulders was my scent. White Shoulders was introduced during the 1940s. It was made by Evyan in NYC. It's infused with white florals, like Gardenia, Lily of the Valley, Jasmine, Tuberose, Lilac, Lily and Orris. There is also Amber, Musk, Benzion, Civet and Oak Moss as final notes. I tried to find out if this this has been reformulated but haven't been able to confirm that. In 1978 Lauren by Ralph Lauren was introduced. It was his first fragrance for women. It is a heavier floral than the White Shoulders. It consists of Rose, Carnation and Violet. Although those who voted, rated it strong for Lilac and Lily of the Valley. I wore it during the early years of our marriage. I really should find a new bottle if it hasn't been badly reformulated. There is a smidgeon still left in my bottle but it has altered slightly as it has aged. At one point Bill bought me a bottle of one his newer fragrances - Romance, but it wasn't a keeper. Dior launched Poison in 1985. I began wearing it in the 90s. This is the scent my children will remember long after I'm gone because I wore it for most of their childhood. It is a chemistry of Coriander, Wild berries, Orange Honey and Tuberose. At one point a sales clerk told me it was a Gardenia based fragrance but I didn't see that in the Fragrantica description although voters rated it for Gardenia. It was created by Edouard Fletcher. It has reportedly been reformulated. A few years ago, I worried that I smelled a little too old lady even though I got tons of compliments when wearing Poison. My daughter left a bottle of Viva La Juicy by Juicy Couture in her room when she moved out. It was on display because it was such a cute bottle. I tried it on one day and loved it. I've been wearing it ever since. It was introduced in 2008 so it is a relatively newer fragrance. It is a white floral infused with Honeysuckle, Gardenia, and Jasmine. It presents with Mandarin and wild berries. Base notes of Amber, Caramel, Vanilla, Sandalwood and Pralines. Many times fragrances alter once they are on my body. They also have a tendency to give me a headache. These fragrances do not give me a headache and they stay pretty true to scent throughout the day. All of my favorite perfumes seem to have a variety white florals in them on the various levels attributed to fragrances. All of them were rated high for Jasmine. 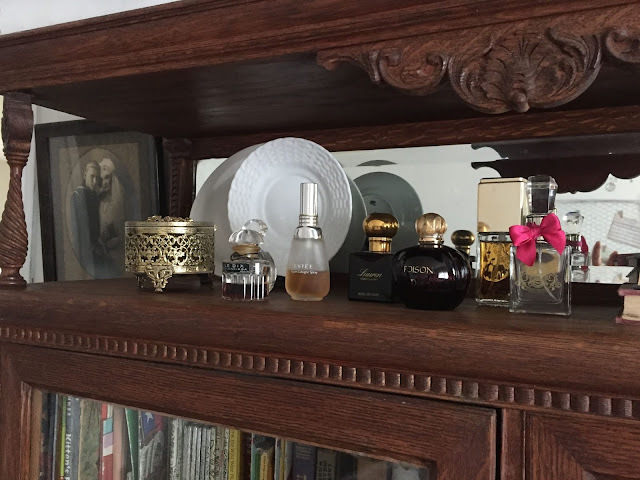 Fragrances can change as they age so keep that in mind when buying older vintage bottles. 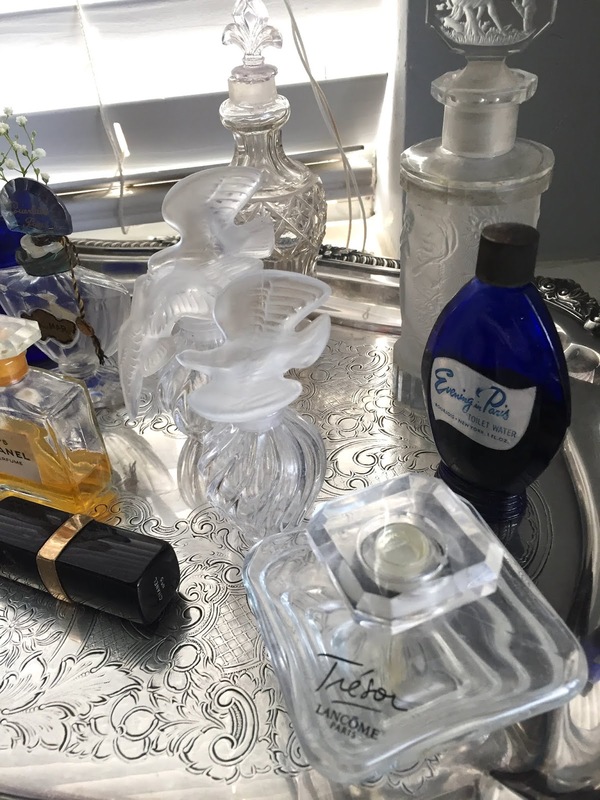 I've kept some of the bottles that were a part of my fragrance history. Halston wasn't a particularly cute bottle which is why it was purged at some point. I hope you enjoyed this post. I enjoyed writing and researching it. I recommend the Fragrantica website. It was fun to peruse and explore. I think I'll wear one of these oldies tomorrow. Leave me your history in the comments below. I wish I could wear fragrance now -- I can't. But I do remember Liz Claiborne in the fun and bright triangular bottle, Muguet des Bois and #5, of course. There was an Elizabeth Arden in a pink-capped spray I loved too. Gentle scents. I miss it. But I love your bottle collection! My mom wore White Shoulders...I remember how it was so strong--a little went a long way. I wore Intimate by Calvin Klein, and Lauren in my early twenties. In the past few years I've worn Flower Bomb, Mademoiselle Coco, and Gucci. I think I've always loved fragrance with a floral mix and also earthiness. I also tend to wear one for day and one for night. Right now I'm wearing Arizona in the evening, and Clean White Woods during the day. Sephora carries a whole line of the Clean brand---love it. Thanks for a great post. A little whiff reminds us of the times when we wore them. Remember...the fragrance in the bottle evaporates over time. After 8 months or so it's definitely not the same. When I see one of my bottles getting low, I use it up fast! I cannot even remember for certain the first fragrance I wore, but it was made by the same company as Chanel #5. My dad brought my mother Chanel #5 home from a business trip to Europe. He brought me another fragrance by the same company. My favorite fragrance ever was Michelle by Balenciago which I found in Paris in the 80s. It was discontinued several years ago. In the 90s I wore Goldleaf by Thymes, but my husband did not like it so I gave that up. Now I am wear Ode L'Orangerie by Lancôme. I feel a headache coming on at the thought of Charlie! The memories... Your collection is beautiful. Love's Baby Soft was my high school fragrance. Their ad line was: Because innocence is sexier than you think. At bell choir practice one night, one of the guys in the group walked behind me to get to his spot, stopped, walked back smelled me and said Wow, you smell great! I'll never forget that! This post brought a smile to my face. I remember my mother wearing Opium in the 80's and when Calvin Klein's Eternity was the thing. I'm up very early and I'm having such a delightful time with your blog! I had it sent to my email just the other day and I was so pleased to see it post yesterday! I immediately flagged it and here I am, sitting at my beloved secretary desk, learning about your fabulous fragrance history! I am utterly fascinated and can't wait to get my little feminine hands on some Viva La Juicy by Juicy Couture! All you had to do was tell me it was infused by Honeysuckle, Gardenia and Jasmine and I was sold! The fact that it's 'true to scent', thus no headache, makes a big difference to me so thank you for pointing that out. I'm also pleased to hear it does not alter. Wow, My Friend, you really did your homework for this post! You must be exhausted! My perfume of choice has been Channel No.5 for a very long time. Some dear friends from Swansea, Wales flew over for a visit about 15 years ago and they brought me a bottle they had purchased at Duty Free. I was so impressed and took right to the fragrance. I may go look at the web site you suggested to find out what it's infused with and what it's base notes are. Thanks for the information. Your lovely post on Sunflowers was lots of fun so I'll go back now and peruse it a bit longer! I adore fall so you've got me hooked, Katie! Take care and enjoy this beautiful, God given Day!! Innovation and Science have grown better Meryl Streep Skin Cream and viable approaches to dissect the fixings being utilized in beauty products.